Summary of the Senate proposal and its comparison to previous years and authorized investment levels. The Senate Appropriations Committee June 7 unanimously approved legislation that would boost federal highway investment by $1.8 billion in FY 2019. This growth would come on top of a $3.4 billion increase in FY 2018 and would result in a 12.2 percent increase over the last two years. The measure includes a combination of transportation investment increases stemming from the 2015 FAST Act surface transportation reauthorization law and the two-year funding agreement reached earlier this year that calls for at least $10 billion per year in supplemental infrastructure investments from the federal general fund in FY 2018 and 2019. Transportation construction programs received a total of $4.85 billion from this agreement in FY 2018. The major beneficiary of the supplemental resources under the Senate plan is the federal highway program, which would receive $3.3 billion on top of the FAST Act’s $1 billion increase. 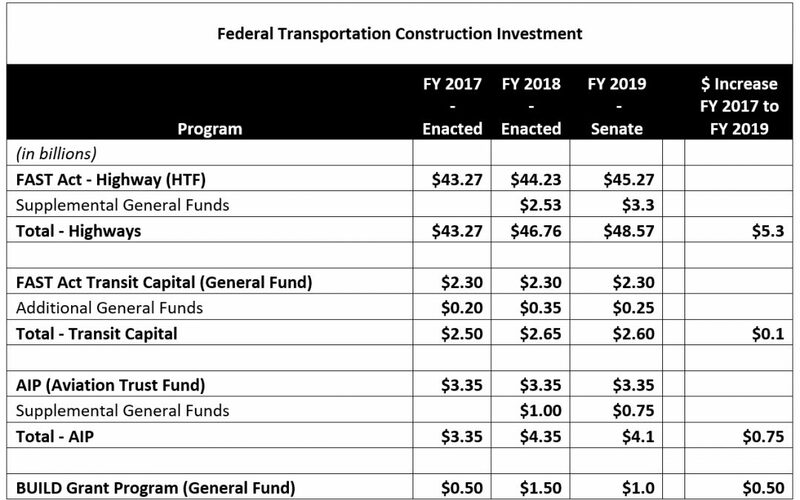 With the release of the Senate proposal, we now know the final level of total FY 2019 highway investment will be somewhere between $48.57 billion (Senate) and $49.5 billion (House). Of the Senate’s supplemental $3.3 billion, $2.4 billion would be distributed to the states and be eligible for a wide variety of surface transportation purposes, $800 million would be designated for bridge improvements, $90 million would support elimination of highway rail crossings, and $20.8 million would be reserved for the Puerto Rico and territorial highway programs. Senate appropriators also allocated $800 million of the supplemental funds to the transit program and $750 million to support needed airport infrastructure improvements. The House Appropriations Committee May 23 approved an FY 2019 transportation funding measure that, among other things, would fully fund the FAST Act’s authorization levels and provided an additional $5.25 in supplemental transportation funding. By comparison the total additional resource in the Senate measure is $4.85 billion—the same level as the final FY 2018 bill. ARTBA will continue to push for maximum levels of federal transportation infrastructure investment as the FY 2019 appropriations process moves forward.